Fancy colored diamonds have significantly increased over the last decade, 445% over the last 10 years. Fancy Colored Diamond investment is a long-term investment. These 'Natural Fancy Purplish Pink Diamond Hoop Earrings' contain almost 90 points of pink diamonds surrounded by over a five eights of crystal clear white diamonds! Collector's piece as well as Investment Grade on your Fancy Pinks, part of our 'IGYSL Collection'. Retail:$14,008, IGYSL List:$7500, On Sale: $4400. Compare at top Design Houses for $20k+. We look forward to earning your business, and working with you to help build a brighter silver lining for you and yours! 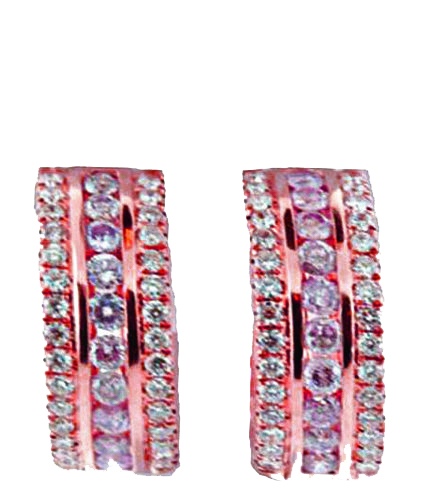 Click the button below to add the Purplish Pink Diamond Hoop Earrings to your wish list.